We are proud and happy to announce that Myngle is selected as one of 50 the most promising high growth companies in the Benelux region. Therefore Myngle isÂ invited to presentÂ at the Benelux Venture Forum on the 18th of March 2008 at the Federation of the Enterprises in Belgium, in Brussels. 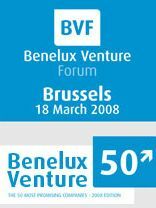 On 18 March 2008, the 7th edition of the Benelux Venture Forum will take place at the Federation of Enterprises in Belgium (FEB). Over the past years, the Forum has established itself as a unique platform promoting a dynamic and professional image of innovative entrepreneurship and venture capital in the Benelux region to the rest of Europe.For the first time, the 50 most promising Benelux companies will be selected by our prominent advisory board members and experts. These companies will present at the Benelux Venture Forum. This entry was posted on Wednesday, March 5th, 2008 at 1:26 pm	and is filed under Myngle News, Press. You can subscribe via RSS 2.0 feed to this post's comments. You can comment below, or link to this permanent URL from your own site. Your comments will appear immediately, but I reserve the right to delete innapropriate comments.